Ah, Barcelona. Everyone loves this city, except me. It was just too commercialized and not aesthetically pleasing (just my experience). Despite my dislike for Barcelona, I believe it’s definitely worth a visit. 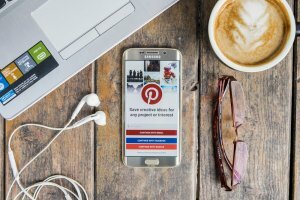 Otherwise, I wouldn’t be writing this post, right? 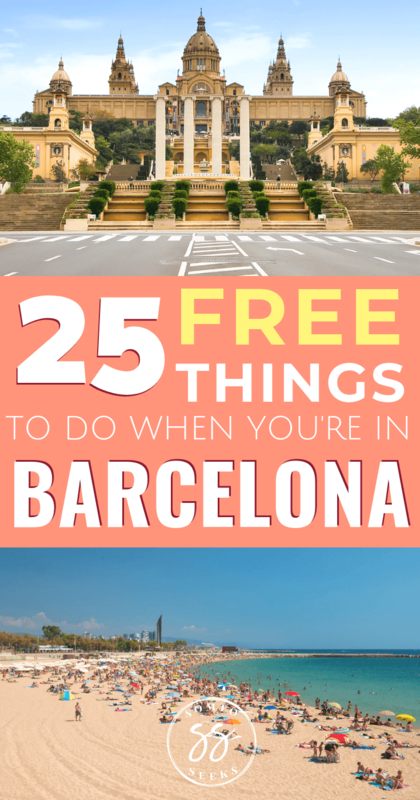 I’m going over the free things to do in Barcelona for the budget-conscious. 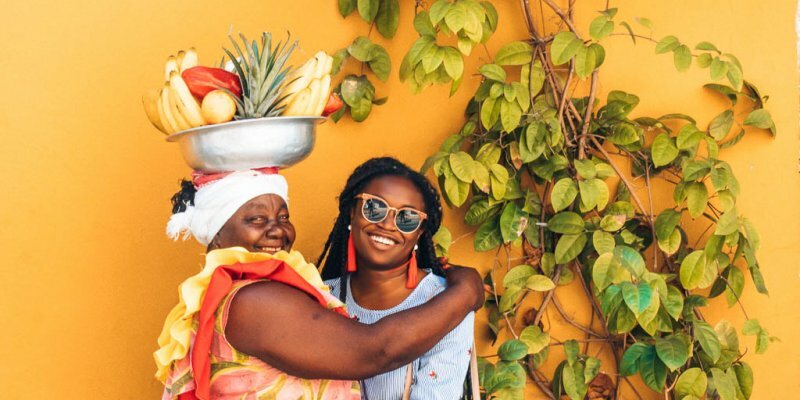 Whether you’re planning your first visit or returning for the fifth time, you’ll find lots of free activities to add to your Barcelona itinerary. Some of Barcelona’s most iconic museums are free on Sundays from 3 pm to 8 pm. 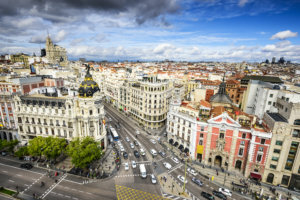 These include the Picasso Museum, the Barcelona City History Museum, and the Maritime Museum. Lines can get really long so try to arrive before 3 pm. What can you find at these museums? The Picasso Museum is dedicated to the life and works of Pablo Picasso, one of the most famous Spanish painters. This museum houses a whopping 4,000 of Picasso’s works. Next, the Barcelona City History Museum showcases artifacts dating back 2,000 years to the Roman occupation. 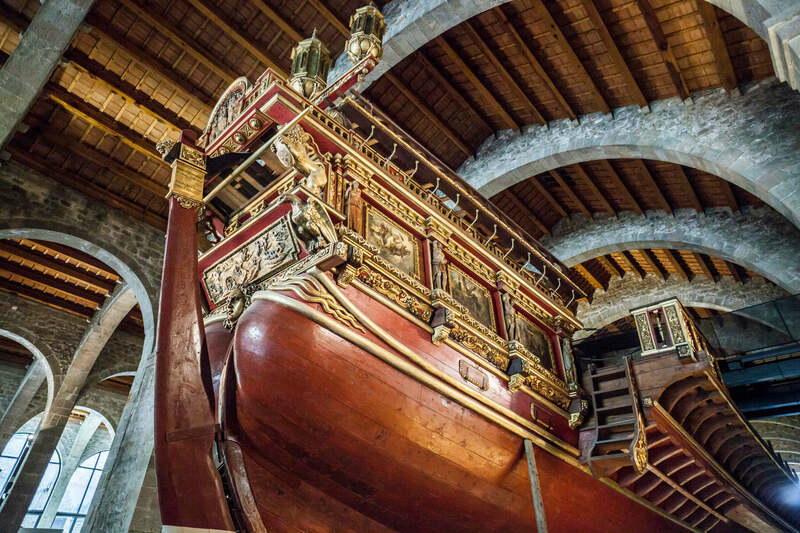 Lastly, the Maritime Museum has an extensive collection of ships from Medieval Spain on display, along with interactive videos and audio. Picasso Museum: Montcada, 15-23, 08003 Barcelona, España. 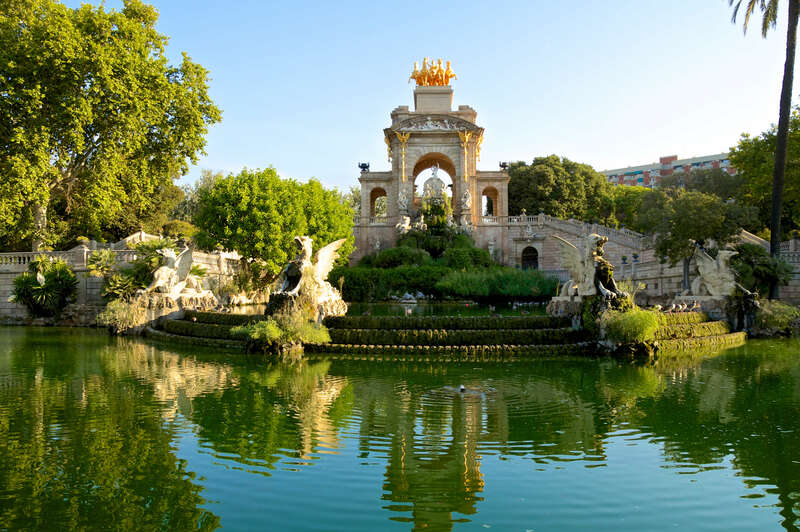 Parc de la Ciutadella is one of the only natural environments in the concrete jungle that is Barcelona. When you need some relaxation, this is a good place to go. You can take a casual stroll through the park, admiring the majestic fountains and greenery. There is also a lake full of ducks, which you can feed! 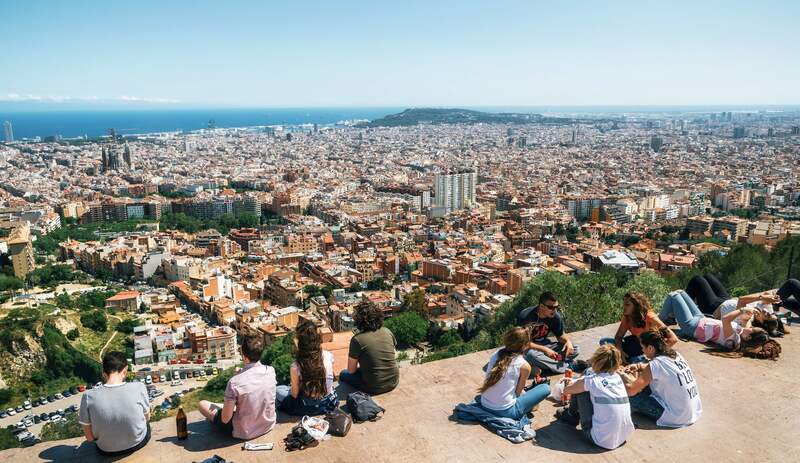 Bunkers del Carmel, located in the El Carmel District, is possibly the best place to get a panoramic view of the entire city of Barcelona. You can easily spot La Sagrada Familia and other iconic buildings in the distance. What exactly are these bunkers, anyway? Well, during the Spanish Civil War in the 30s, they were used to store guns and defend against Dictator Franco’s attacks. Getting to the top requires you to climb the Turó de la Rovira hill, but the views are so worth it. I wouldn’t count Barcelona’s beaches among the best beaches in Spain. That said, some are definitely better than others. 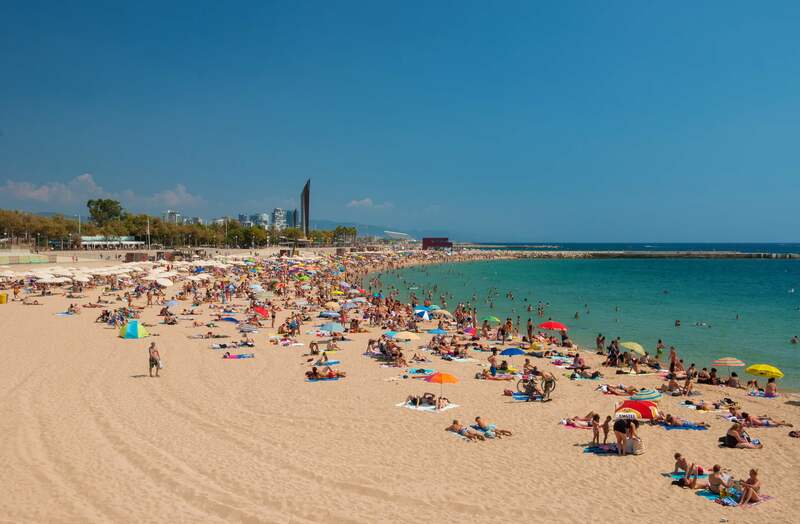 There are six beaches in the greater Barcelona area: La Barceloneta, San Sebastiá, Bogatell, Nova Icária, Mar Bella, and Sant Miquel. La Barceloneta is the closest one to the city center, but I’d skip it. There are way too many people! Plus there’s trash everywhere and vendors shoving souvenirs in your face. There are also a couple of nudist beaches in the mix, but I’m assuming you like to wear clothes. With those things in mind, I’d recommend you go to Nova Icária, just a 25-minute tram ride from the city center. 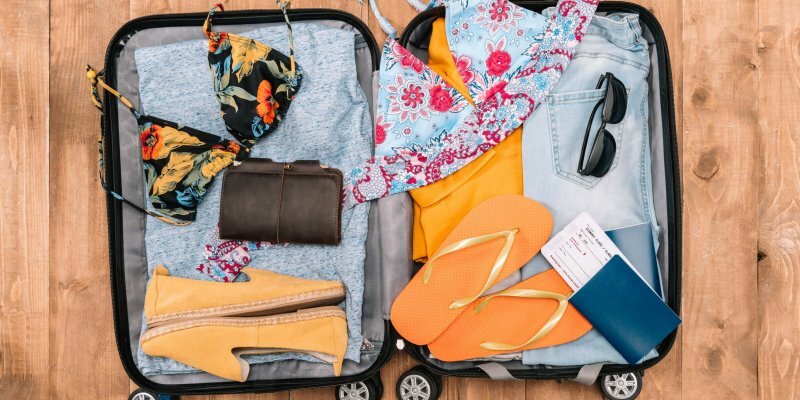 It is relatively clean, relaxing, and not-so-crowded. Passeig de Gracia is a long street in the Gracia neighborhood that is lined with iconic buildings. On this street, you’ll find several Gaudi works, such as Casa Batllo and Casa Mila. it’s best to stroll them the street first thing in the morning to avoid the inevitable crowds. One of the unique things to do in Barcelona is to explore the one-of-a-kind coffees shops. They are all over the city, but you’ll find a high concentration of them in the Gracia neighborhood. 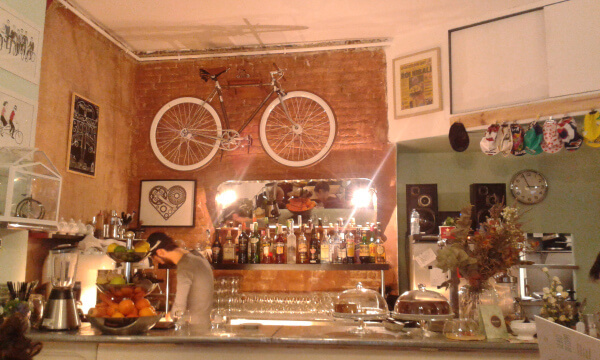 Some cute coffee shops to check out are Bicioci Biker Café, which has bicycles on the walls, and the very cozy Mama’s Cafe. 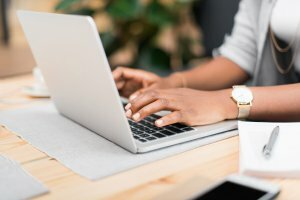 These are also great places to get some work done. They have free WiFi. 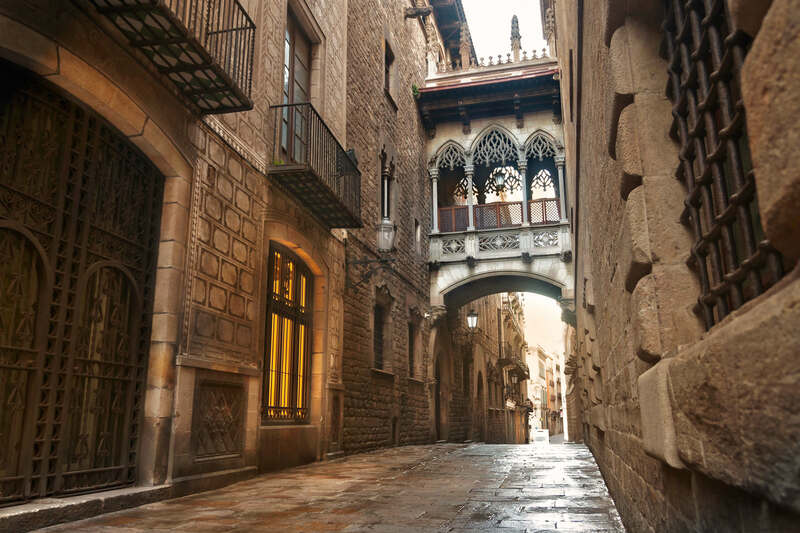 The best way to see Barcelona is on foot, and there are tons of free walking tours in the city. 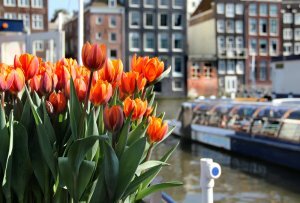 Do not pay for a walking tour! You either create your own self-guided walking tour or join a company tour, such as Sandeman’s free walking tour of Barcelona. 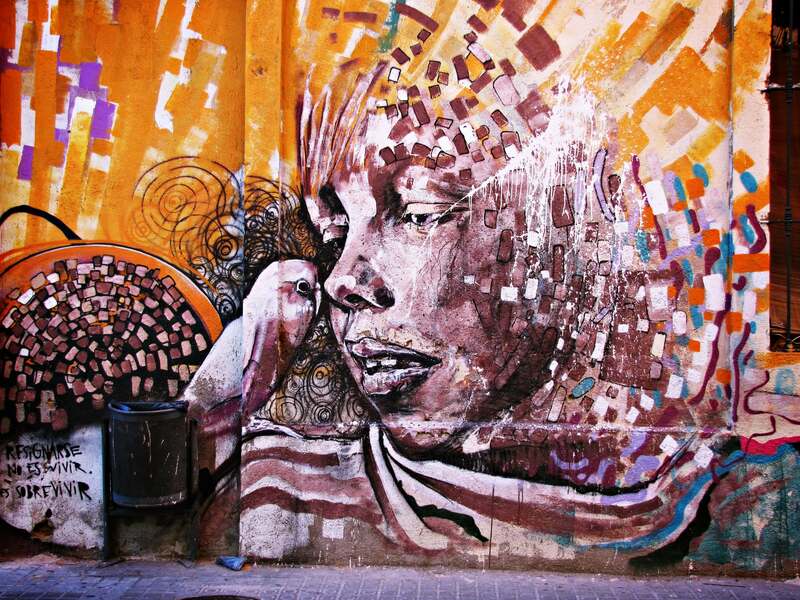 Barcelona has quite a collection of graffiti art and murals. One of the best places to see them is in the Poblenou district. Local artists have transformed the place with creative wall art, from whimsical cartoons to political statements. You could spend a couple of hours here viewing all the different creations. The Gothic Quarter is the oldest part of the city, with Roman architecture dating back 2,000 years. It’s personally my favorite part of the city and the perfect place to meander for a few hours. The El Raval District is one of the most multicultural districts of Barcelona, with immigrants from places like Morocco and Turkey. It has a reputation for being rough and sketchy, but that may be overstated. That said, I would err on the side of caution and go here during the afternoon with friends. Pickpockets are known to be more common here. If you want to venture out of the typical touristy areas, this may be a good option. 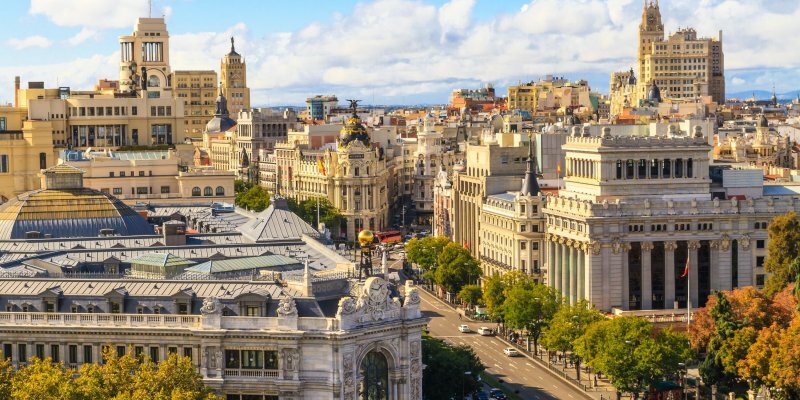 Barcelona is well-known for its nightlife, but you don’t need to spend money to go to the club. There are free concerts at bars across the city. One of the best ones is at Jamboree bar. This bar, located right across from Placa Reial, is a hotspot for jazz, rhythm, and blues. It’s a great place to spend a couple of hours before calling it a day. 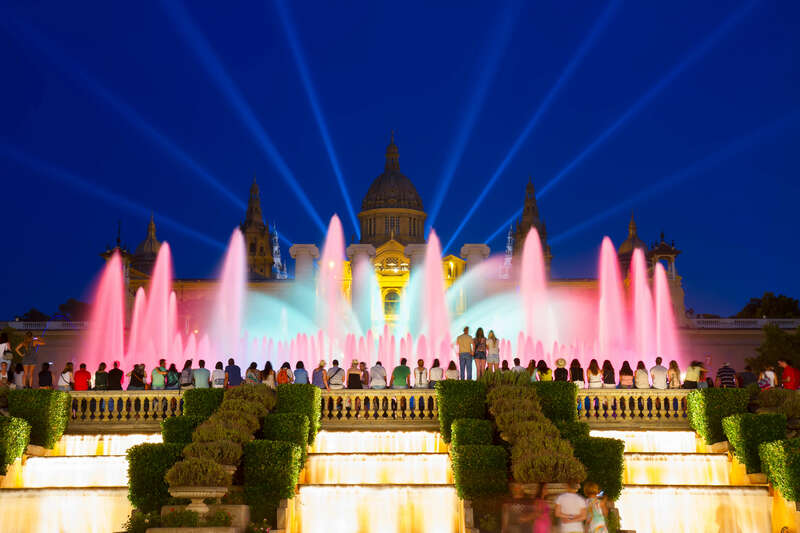 For almost 90 years, the city of Barcelona has put on a colorful light show at The Magic Mountain at Montjuïc. Every Friday, Saturday, and Sunday night, the fountain comes to life with a beautiful display of lights and colors. It’s truly beautiful and worth seeing! The fountain show isn’t the only thing to see in the Montjuic neighborhood. There is a castle, too! And lots of visitors never hear about it. 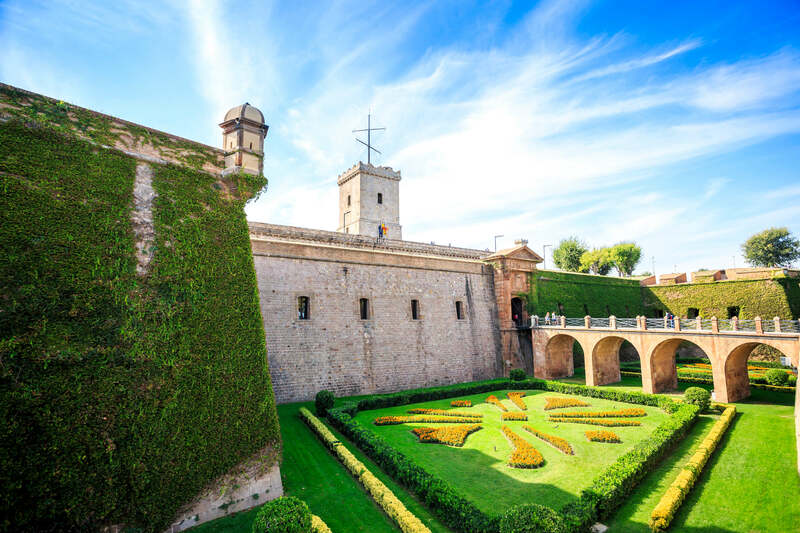 The Montjuïc Castle is a 17th-century military fortress that sits at the top of Montjuïc hill. From here, you can also get a panoramic view of the city and the harbor. Entrance is free on Sundays after 3 pm. La Sagrada Familia isn’t the only famous cathedral in the city. 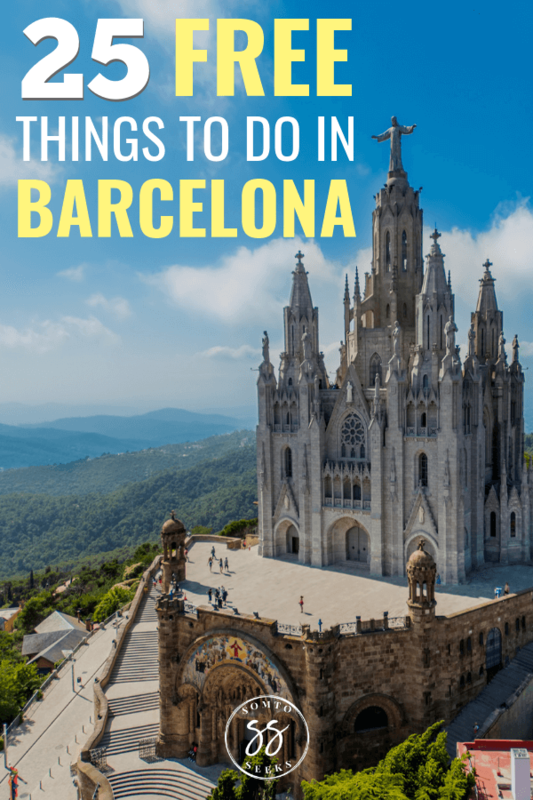 There’s also the Cathedral of the Holy Cross and Saint Eulalia, also known as the Barcelona Cathedral. This church was built in the Romanesque style, with grand arches and high walls. Best of all, it’s completely free to enter! The El Born Cultural Center is another important archeological site in Barcelona. There, you’ll find preserved ruins dating back to the 18th century. The entire structure, which used to be a marketplace, houses excavated buildings that tell the story of Catalunya’s past. This is a great spot for history buffs. and it’s free all year round. 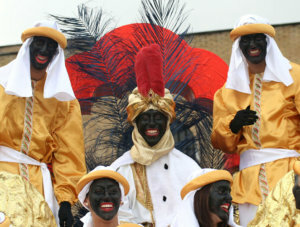 Okay, so one of the things I like the most about Spain is the over-the-top festivals. My absolute fave is Las Fallas, which takes place in Valencia, just two hours south of Barcelona. 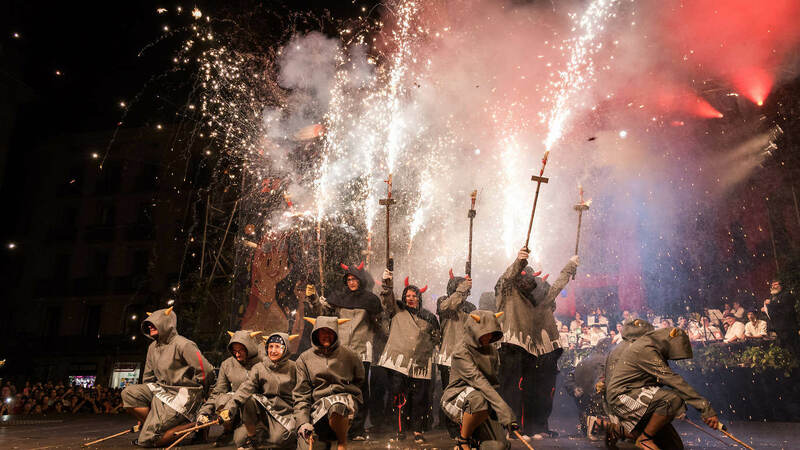 If you’re in Barcelona in August and September, you can experience two of the cities grandest festivals – Festes de la Merce and Festa de Gracia. Watching a festival is one of the most fun things to do in Barcelona. Seeing Gaudi’s works is the reason to visit Barcelona. While it’s nice to go inside the buildings, the exteriors are also pretty enough to look at. There are many free Gaudi tours that will guide you to both the well-known and the little known Gaudi sites across the city. 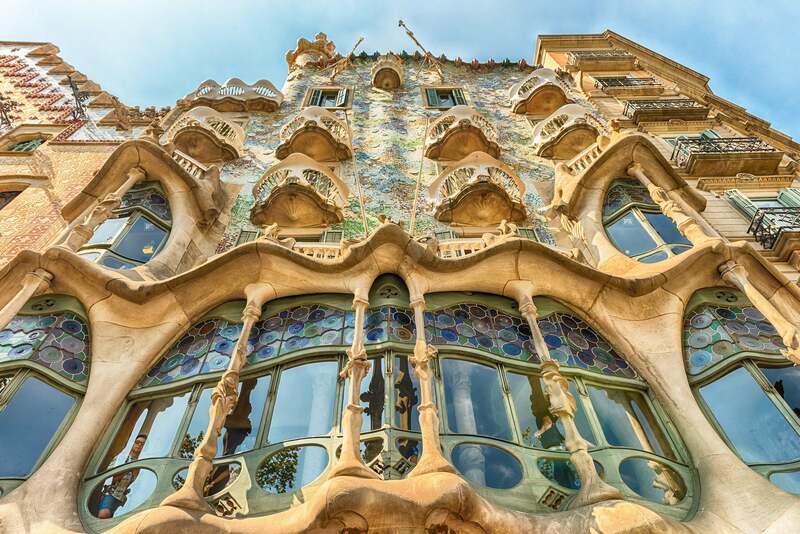 Try Runner Bean Tours for a guided tour of La Sagrada Familia, Casa Mila, Casa Batllo, and more. Barcelona hosted the Olympics in 1992, and now the Olympic Stadium is open to the public. Here, you can explore the actual Olympic Ring as well as the surrounding Olympic Park, which is quite pretty. There’s no entrance fee. Okay, La Sagrada Familia has some major competition. This church, which took 60 years to build, is STUNNING both inside and out. It sits at the top of Tibidabo Hill, another great vantage point to get a bird’s eye view of the city. In fact, this is the highest point in all of Barcelona. You can walk up a half a mile of stairs or take the elevator. Collserola Park is a great alternative to Parc de Ciutadella, although it’s farther away from the city center. 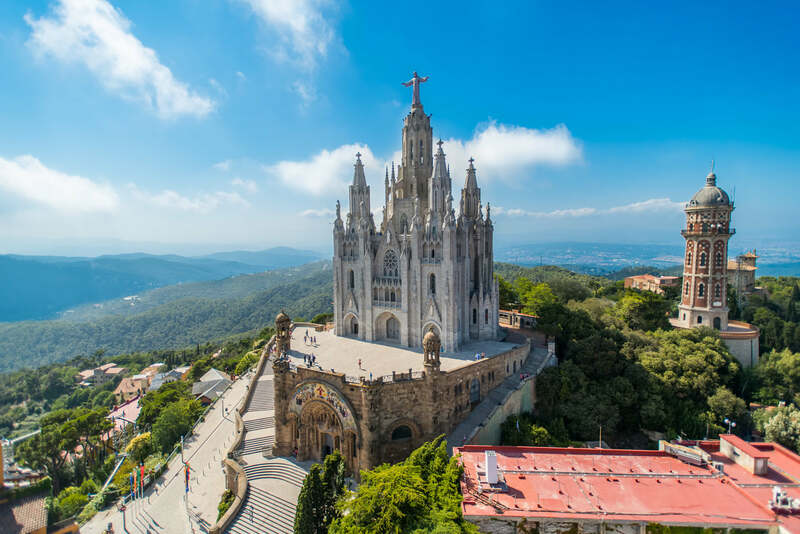 It’s located in the Tibidabo area, not too far from the Sagrado Corazón de Jesús Temple. There, you can take in the natural surroundings and relax for a minute. Not many tourists know about this place so it’s a great escape from the crowds in the city center. The main part of Gaudi’s cartoonish work, Park Guell, requires an entrance ticket. But that’s just for the main area known as the monumental zone. You’re free to roam around the rest of the park. 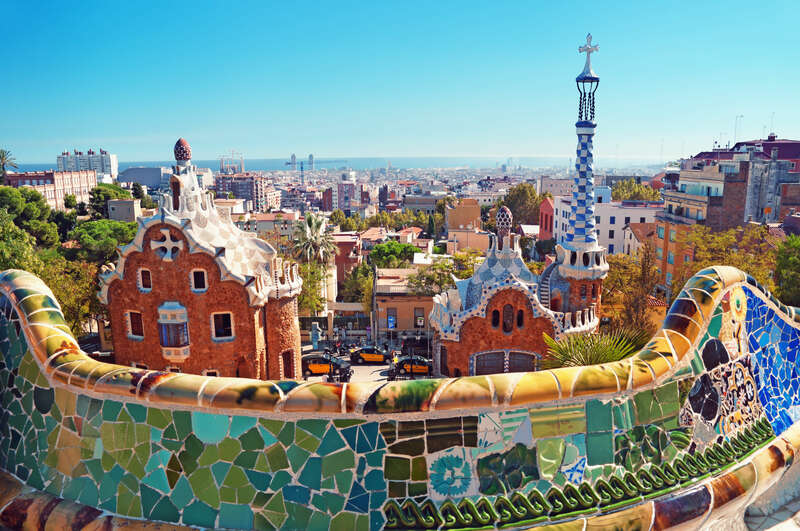 Also, from April to October, Park Guell is free every Sunday from 5 pm to 10 pm. Just like Madrid, Barcelona has hundreds of bars with a terrace at the roof. The bar at the Barcelo Hotel in the Raval district is not only a good place for drinks, but also for watching the sunset. Sure, you can watch a good sunset at Bunkers del Carmel, but this location is less known. Therefore, it’ll likely be less crowded. Every Spanish city has a central plaza or main square where people go to sit, relax, and unwind. 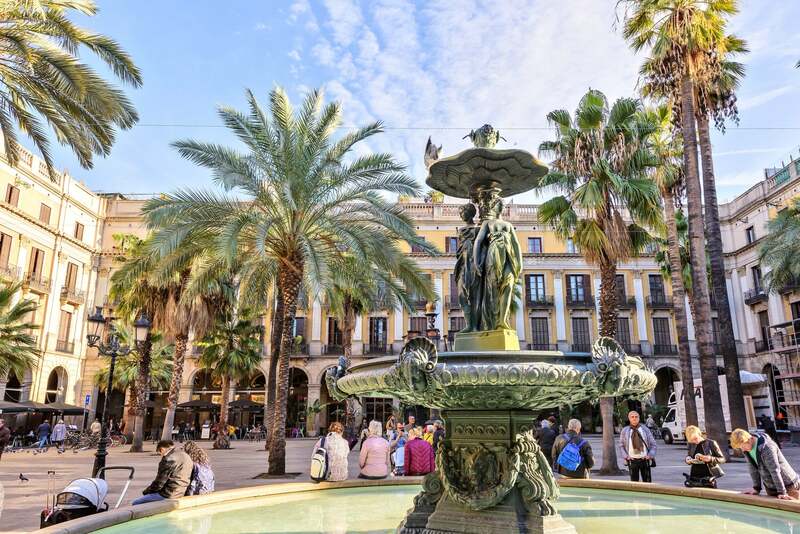 Barcelona’s is called Plaça Reial, and it’s a great place for people watching. After walking all day, you can sit here for a bit, observe, and destress. This victory tower isn’t really anything special, but it’s right next to Parc de La Ciutadella and provides a nice background for photos. After visiting the park, you make a quick stop here, walk down the passageway, and pose for some pics. 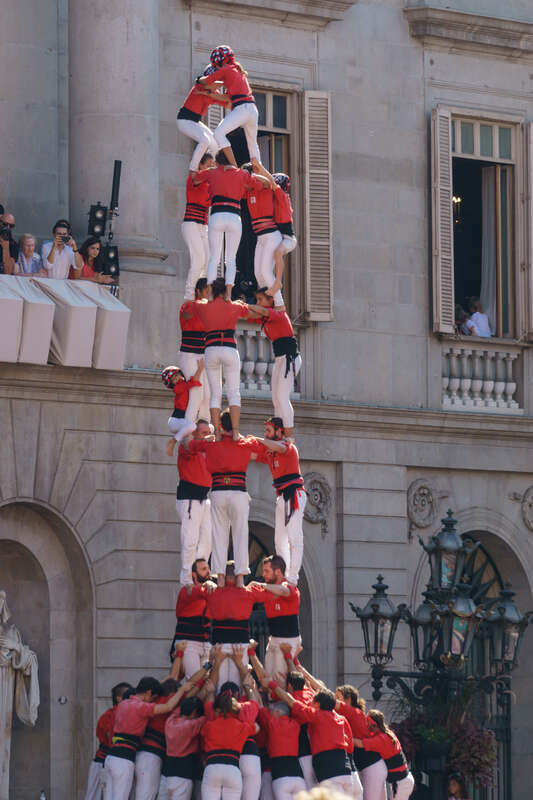 One thing that Catalunya is famous for are these crazy human towers called Castells. They are one of the best things to see in Barcelona. These sky-high formations normally occur festivals, but you can also see them during the regular season. There is an official castell group in Barcelona called the Castellers de Catalunya. They put on free shows and also practice in public. Check out their website for upcoming shows and events. 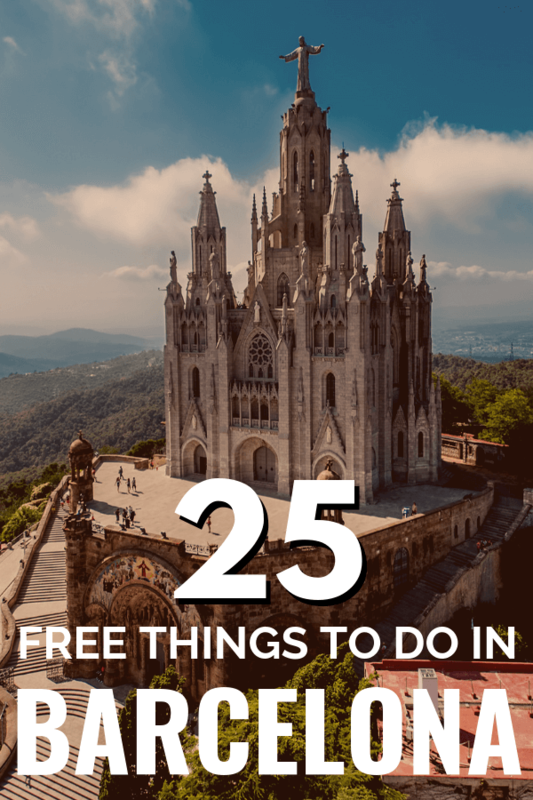 There you have it – the best free things to do in Barcelona. 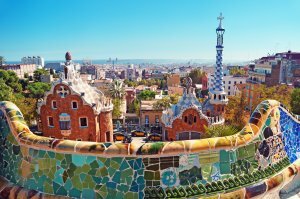 Which of them will you add to your Barcelona itinerary?